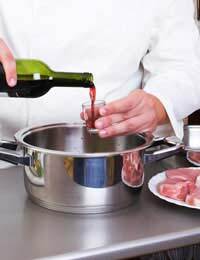 Wine has been an ingredient in cooking for – in all probability – as long as wine has existed and is used principally for its strong flavours: cooking neutralises the alcohol content of wine. Wine used in cooking has the twin benefit of complimenting food, whilst also complimenting whatever wine is being consumed at the table. It is advisable to use a wine that you are happy to drink in your cooking. Don’t be fooled into thinking a poor wine will do. Wine used in cooking will become a main characteristic flavour of your meal, so choosing the right wine is essential. Red Wine: Full bodied reds go well in meat dishes, including casseroles and – an obvious one – Coq Au Vin. Earthier reds go well with rustic soups. White Wine: White Wine goes well with fish and poultry, seafood soups and white sauces. Fortified Wine and Dessert Wine: Goes well with dessert! As with pairing wine and food it makes sense to choose a wine that is indigenous to the same region as the food you are cooking. This will help to best enhance the flavour. Though it is best to use a good quality wine, it is unwise to use anything approaching a fine wine in your cooking. Keep the best wine in your budget for drinking with the meal and use another reliable wine for cooking. Using a top end wine will not greatly improve your cooking, but using a poor wine will dramatically worsen it! Wine should be added early on to a casserole or other dish that is cooked over time. Adding it late may impart a harsh taste that is not one with the other ingredients. When this occurs tannin and acid flavours are usually highly evident in the finished dish. This may also occur as a result of using opened wine stored incorrectly. For this reason it is vitally important that wine is respected as an ingredient – the addition of wine alone will not make a dish perfect. If done without forethought it will ruin a good wine, as well as a good dinner; an expensive mistake! It is a good idea to follow recipes as closely as possible. Never, for example, swap a red for white. And if a recipe dictates you use a very specific wine, then try your best to do so: There is in all likelihood a reason for this. Some of the simplest recipes involve wine with dessert. In some cases this merely entails drizzling a wine over a finished pudding. This has two advantages: One it needs no cooking of the wine; Two, the wine retains its full flavour and alcoholic strength! This may be the best place to start experimenting with wine as an ingredient. Try pears with a generous dash of sherry or dessert wine! Other simple ways to start include noting the effect that wine has on Bolognese sauce. This is a well known recipe idea that most of us have tried. However, if you really pay attention you will be able to note the difference in taste according to quantity/variety/length of cooking and so on.